A Chinese Canal for Nicaragua? Today, we arrived at Puerto Corinto, Nicaragua at 8 AM. 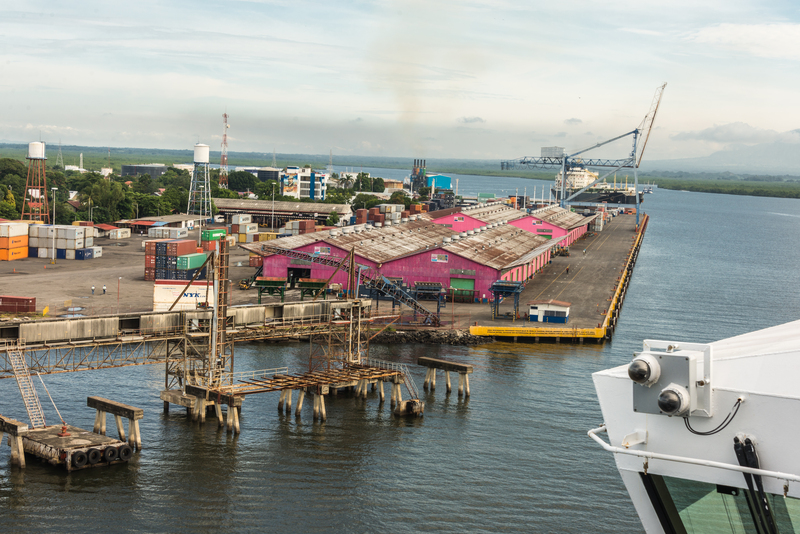 The day was warm, humid, and overcast at 28 C. Puerto Corinto is a small mixed freight and passenger port. Brightly painted long corrugated metal storage buildings, with rusty and corroded roofs covered much of the dock and a foul smell emanating from somewhere close, was a constant reminder that something to do with cattle was not quite right. Our docking help was the responsibility of a single tug today. 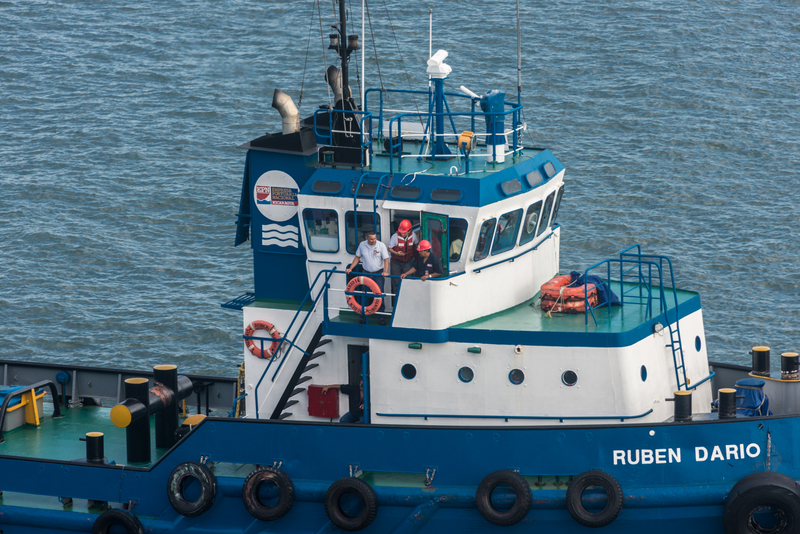 We did not see any other tugs in the harbor so it may be that they only had one. 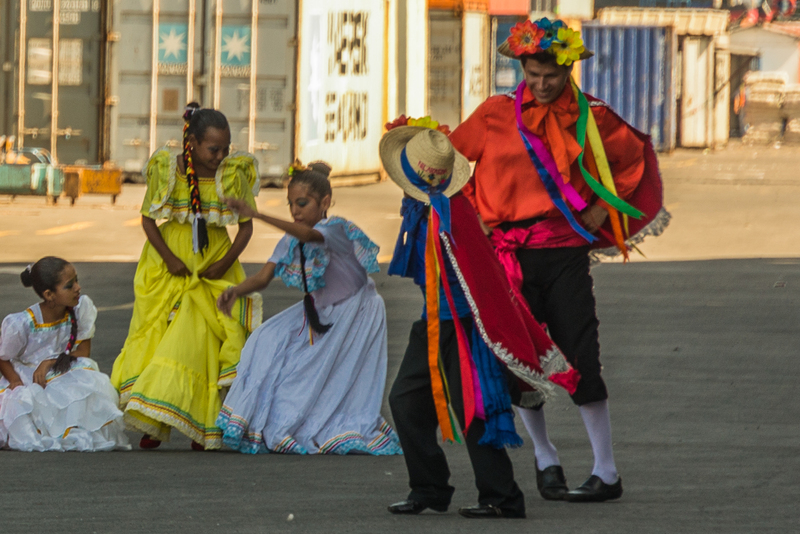 Nicaragua is the second poorest country, next to Haiti, in the western hemisphere so tourism is extremely important to their economy. Major Nicaraguan exports are sugar and coffee. Again, we were the first cruise ship of the season to visit them. Eleven hundred passengers had booked shore excursions to explore Nicaragua. 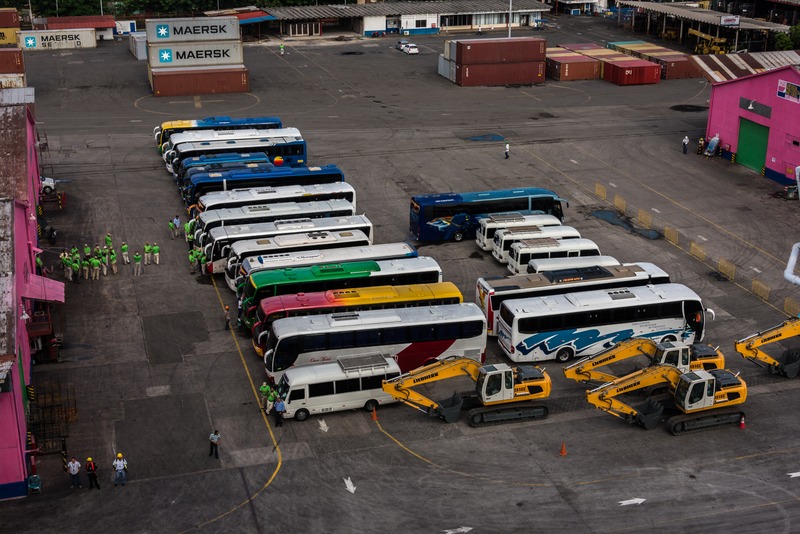 Vividly colored tour busses gathered on the dock between two of the metal sheds. They were close enough to the ship so you could almost walk off the gangplank right onto the bus. 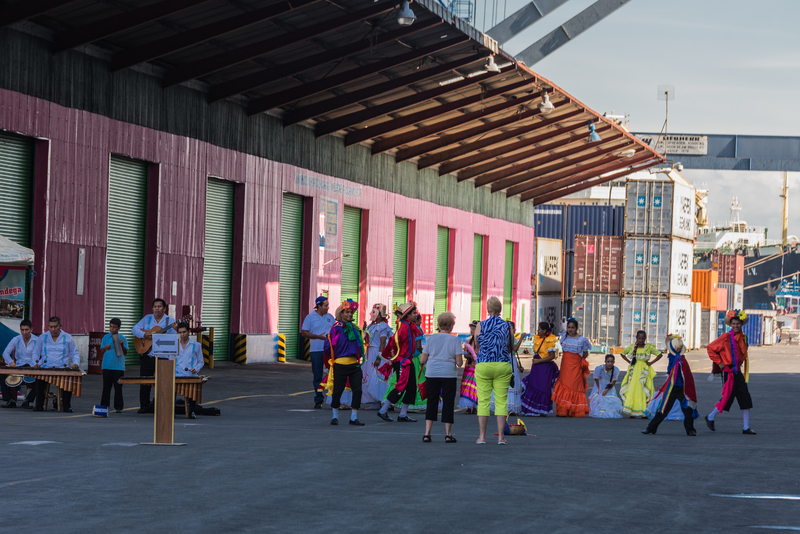 A band and a group of colorful local cultural dancers were performing on the dock as we left the ship. Our busses are large modern MarcoPolo highway coaches in nice condition. The air conditioning worked well and the windows were clean so you could take pictures. Our tour had three busses so it would have been around 140 or so people. It was extremely well organized and the guide spoke good clear English. When we arrived at our destination, each guide took their people around the site in a different order so the crowds were not obvious and there was no waiting. 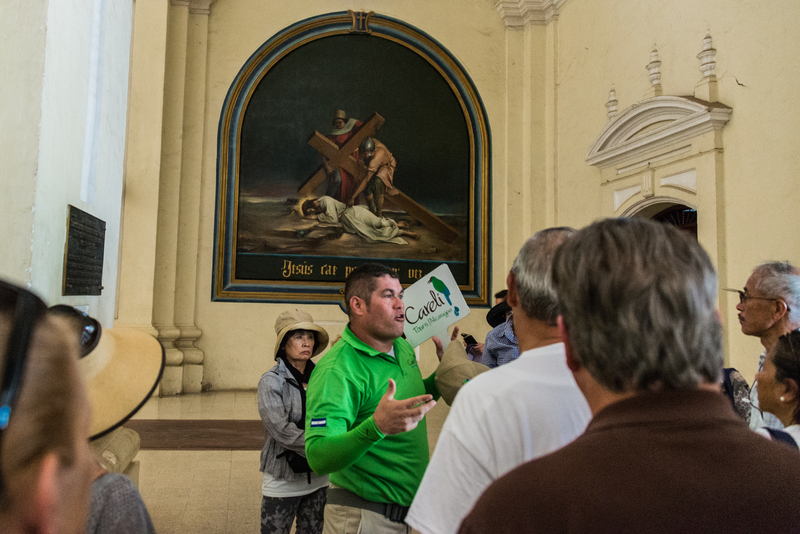 We headed to another Spanish colonial city, this time it was Leon. León is a land of eight volcanoes, hot weather and interesting cities. It was designated a UNESCO World Heritage Site in 2000. The ruins of one of the first Spanish colonial cities that were built in the continent, is preserved thanks to the volcanic sand that buried the place after an eruption. Leon was one of the most impressive colonial cities in the country. 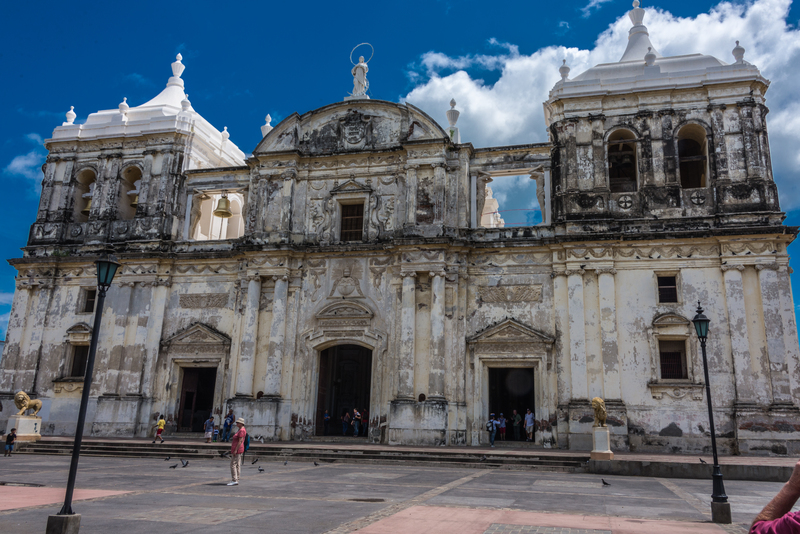 Here, you find hotels, restaurants, bars, tour operators, museums, cultural centers, several colonial churches and the largest cathedral in Central America, which was started in 1746 and took 100 years to build. 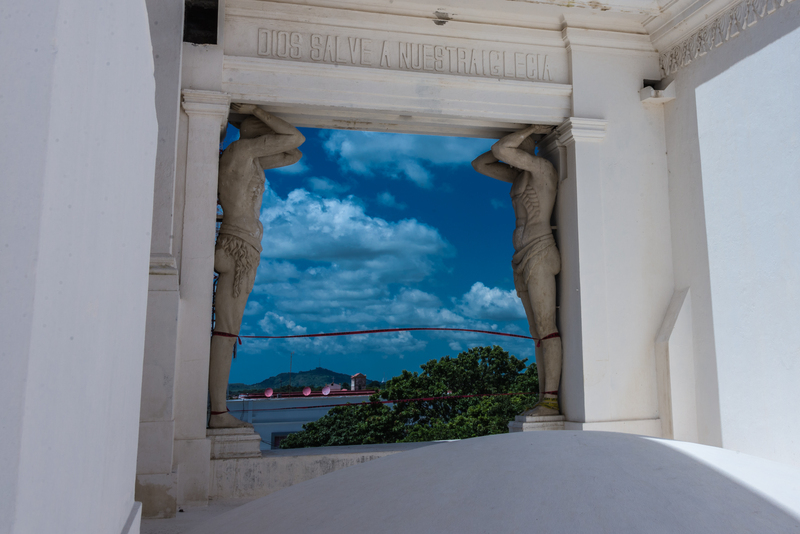 Today León is known for having some of the best colonial architecture in the country. 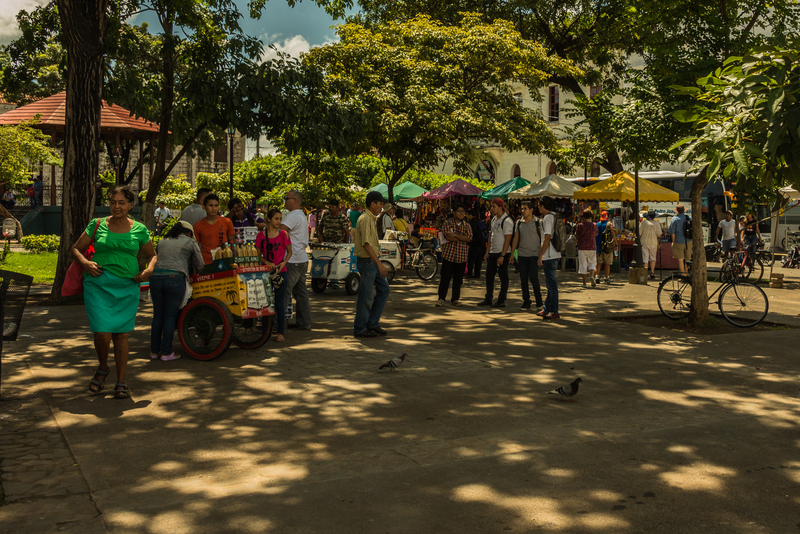 During the revolution in 1978, León was a scene of heavy fighting between Sandinista guerrillas and government troops, leaving much of the center of the city in ruins. 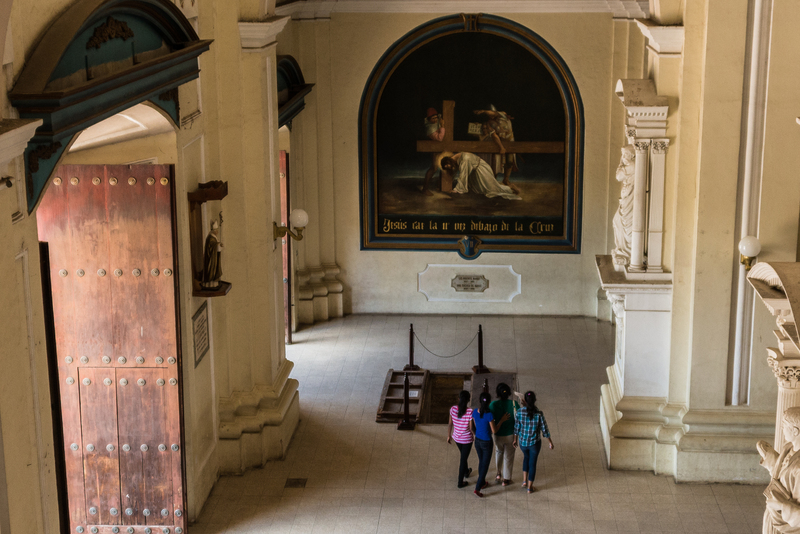 The spectacular Catholic Church was used as a fort, which seems a good choice as the walls are over a meter thick. 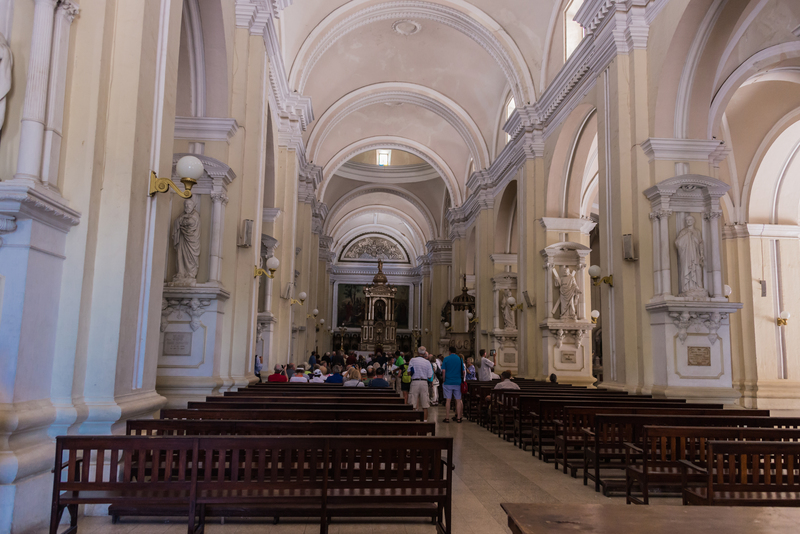 Over the years, the church has been remodeled/rebuilt six times due to revolution and volcano activity. It is currently undergoing another renovation. They started on the roof, which we were allowed to use to get a better view of the city. The stairway up to the roof is very narrow, steep and dark. I imagined one of the super-sized passengers being stuck in the stairway and us not being able to get up or down and missing the ship, but everyone eventually emerged at the top. Before we were allowed out on the roof, we had to remove our shoes. That was due to the brand new fresh white paint job on the roof. It was so intensely white, as we emerged from the shadows of the dark stairway, that a kind of snow blindness hit you until your eyes adjusted to the lack of definition in the monochromatic paint. It was eerie as stairs, and everything else went completely white. Eventually, normalcy returned and we found ourselves on a very interesting roof covered with domes bulging up from the church below. The view of Leon from the top of the old church was spectacular. Wide streets and walkways bordered the beautifully landscaped square in front of the church. The Area around the church contained several restaurants that looked good with English on their signs. There was even a modern looking Best Western down one of the streets. Leon is not quite as colonial as Antigua as there are new buildings among the old colonials that do not match the colonial in style, so the city is not intact. In addition, it is not at a high elevation so it is a much warmer city than Antigua. A hundred years ago, the US selected Panama for a location to build a canal from the Pacific to the Atlantic. It was a bitter pill for Nicaragua because they hoped the new canal would be routed through their country, but the prevalence of active volcanos was enough to sway the decision in Panama’s favor. 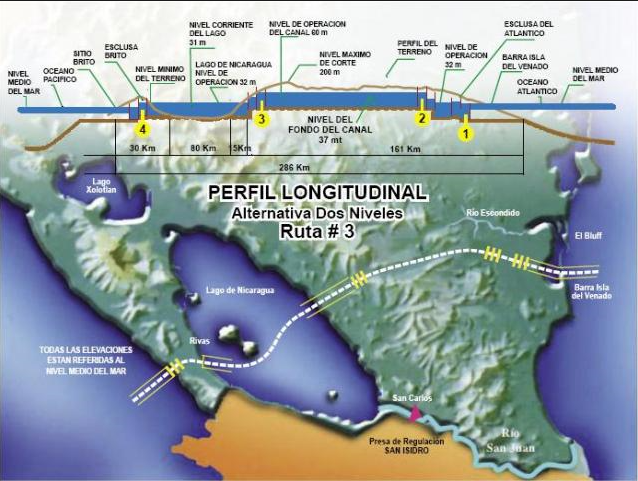 Today, Nicaragua has plans to build a new canal from the Pacific to the Atlantic and some sources say that digging will begin as early as December this year. To date, the project has been shrouded by secrecy and doubt. 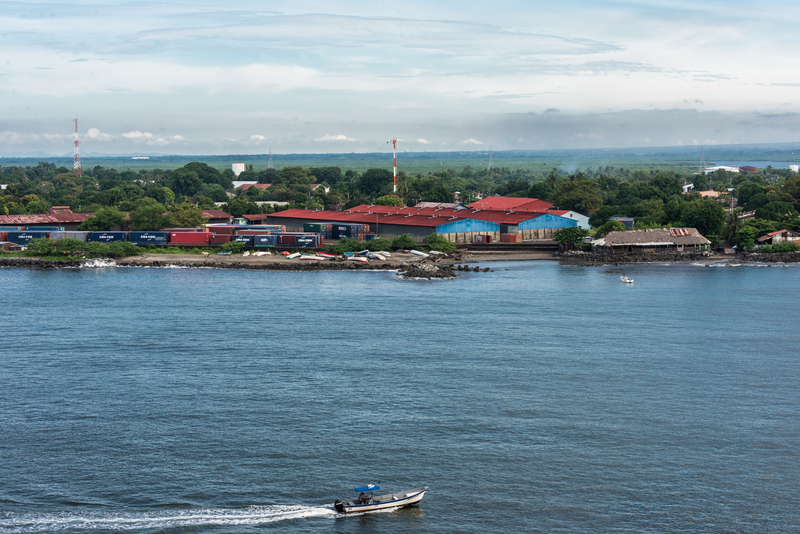 The latest to put Nicaragua’s canal dream on the map is 41-year-old Chinese billionaire Wang Jing, who is said to have amassed his fortune through his telecommunications business. He claims he can raise the $50 billion needed for construction costs. Just between you and me, he also has a not too stellar history of failed projects. Question: I wonder how the US will react to a Chinese canal through Nicaragua. We returned to the ship for a 3PM departure, heading further south to Cost Rica where we should arrive at 8 AM tomorrow. Oh, by the way, it seems that the roof of the Catholic Church is a popular location to go on a date. Interesting! I am loving the pictures and your level of detail and information is outstanding. You are a font of knowledge. Thanks for sharing your adventure. Thanks for the feedback, Sharon. I always have fun doing it. What Do You Do at Christmas? A New Career in Panama? On The Way to Panama… again! Romeo and Juliette – Not the Play!